Every linear optimization problem can be expressed as a set of linear inequalities and an objective function to be maximized or minimized. The inequalities are called constraints, and like all inequalities, they contain variables. 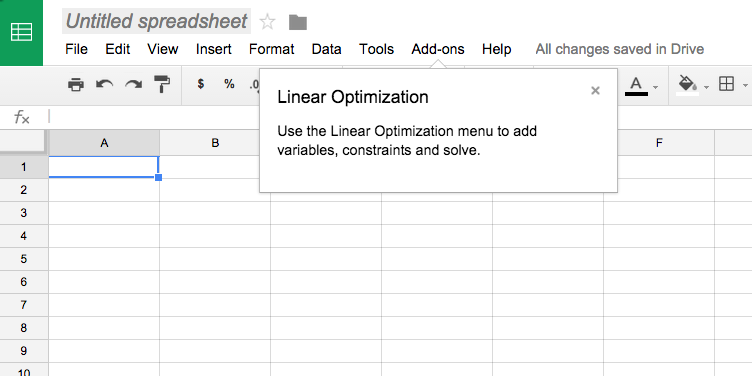 When you install the linear optimization add on, you'll be able to populate your spreadsheet with variables and constraints, click Solve, and see the solution to your problem. This documentation shows you how. 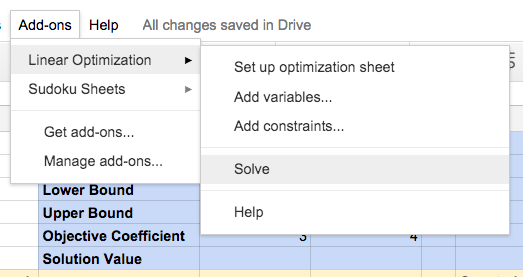 Before you can solve linear optimization problems from a spreadsheet, you need to install the add-on that makes it possible. On that page, just click FREE to install the add-on. Once you install the add-on and grant it the necessary permissions, you'll be placed into an empty spreadsheet ready for your variables and constraints. You'll see a new entry under the add-ons menu. 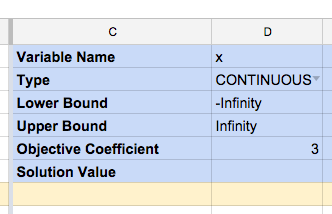 Next we need to specify the coefficients for x and y. Since our constraint is x + 2y ≤ 14, those coefficients are 1 and 2 respectively. 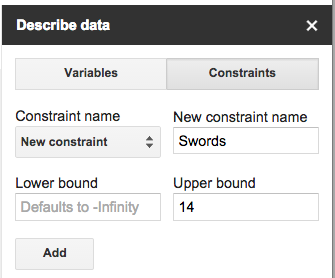 We can now select "Swords" as a constraint again to let us specify those coefficients, or we can add them directly to the spreadsheet. 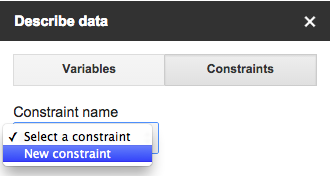 Then we'll do the same for our other two constraints. 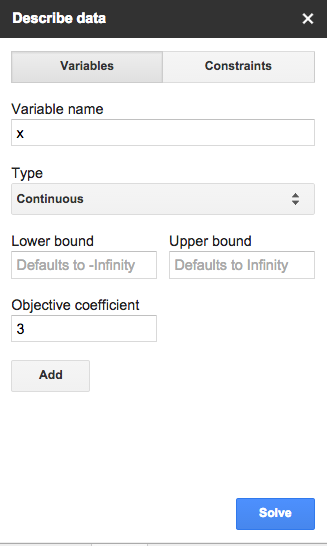 The infinity and -infinity boundaries will be auto-populated; no need to type them. The Linear Optimization add-on is useful for serious problems as well. 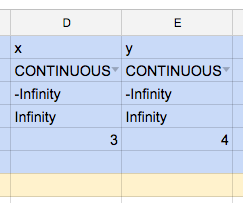 The Stigler diet problem can be solved with a medium-sized Google Sheets file. Much larger problems can be solved as well; there's no practical limit on the number of variables or constraints, so long as it takes Google servers no longer than two minutes to solve the problem. The add-on is made possible by two underlying Google services. The first is Apps Script, which allows Google Sheets to be controlled programmatically. That's how the cells in the spreadsheet can be written to and read from. The second service is the Linear Optimization Service for Apps Script, which allows programs to treat our linear solver as just another function. If the problems has any integer constraints, it's solved using SCIP; otherwise, it's solved using Glop. The API has a timeout of five minutes, rather than the add-on's two minutes, so it's better-suited for larger optimization problems.